[Forty years] ago on September 11, 1973, the Chilean military led by General Augusto Pinochet, crushed the democratically elected Unidad Popular government of Salvador Allende. The military coup was supported by the CIA. Secretary of State Henry Kissinger played a direct role in the military plot. (For details see http://globalresearch.ca/articles/KOR309A.html and references below). 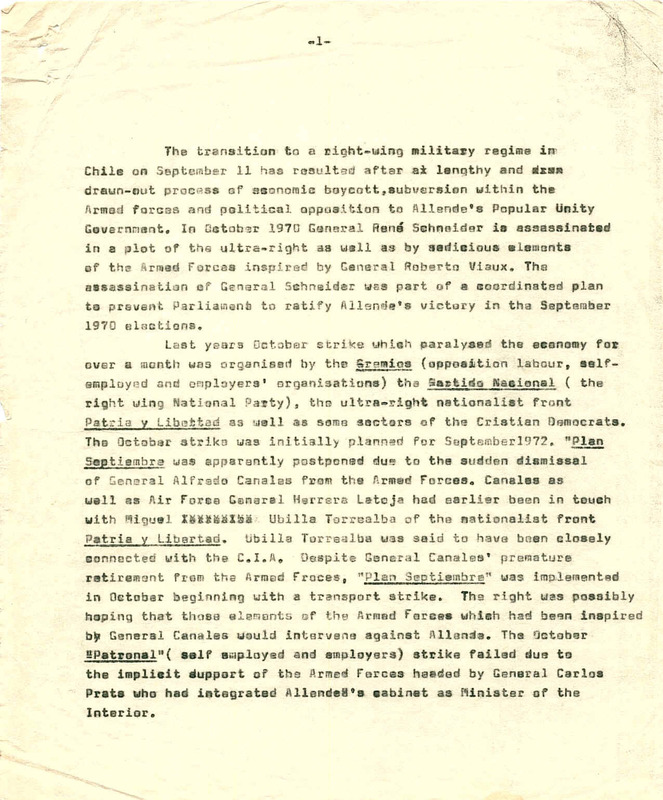 On 23 August, the Chilean Camera de Diputados drafted a motion, to the effect that the Allende government “sought to impose a totalitarian regime”. Patricio Aylwin was a member of the drafting team of this motion. Patricio Aylwin believed that a temporary military dictatorship was “the lesser of two evils.” (See http://www.fjguzman.cl/interiores/noticias/tema_se/2003/julio/Patricio%20Aylwin%20y%20la%20dictadura%20transitoria.pdf , See also: El acuerdo que anticipÃ³ el golpe, http://www.quepasa.cl/revista/2003/08/22/t-22.08.QP.NAC.ACUERDO.html ). This motion was adopted almost unanimously by the opposition parties, including the DC, the Partido Nacional and the PIR ( Radical Left). And continuity in the “Chilean Model” heralded as “economic success story” was ensured when, 16 years later, Patricio Aylwin was elected president of Chile in the so-called transition to democracy in 1989. When the university reopened several days later, I started patching together the history of the coup from written notes. I had lived through the tragic events of September 11, 1973 as well as the failed June 29th coup. Several of my students at the Universidad Catolica had been arrested by the military Junta. I have transcribed the text from the yellowed carbon copy draft. Apart from minor editing, I have made no changes to the original article. I completed my work on the “unpublished paper’ entitled “The Ingredients of a Military Coup” (see text below) in late September. In October and November, following the dramatic hikes in the price of food, I drafted in Spanish an initial “technical” assessment of the Junta’s deadly macro-economic reforms. Fearing censorship, I limited my analysis to the collapse of living standards in the wake of the Junta’s reforms, resulting from the price hikes of food and fuel, without making any kind of political analysis. The Economics Institute of the Catholic University was initially reluctant to publish the report. They sent it to the Military Junta prior to its release. I left Chile for Peru in December. The report was released as a working paper (200 copies) by the Catholic University a few days before my departure. In Peru, where I joined the Economics Department of the Catholic University of Peru, I was able to write up a more detailed study of the Junta’s neoliberal reforms and its ideological underpinnings. This study was was published in 1975 in English and Spanish. Two years later, I returned to Latin America as a visiting professor at the National University of Cordoba in the northern industrial heartland of Argentina. My stay coincided with the 1976 military coup d’Ã‰tat. Tens of thousands of people were arrested; the “Desaparecidos” were assassinated. The military takeover in Argentina was “a carbon copy” of the CIA-led coup in Chile. And behind the massacres and human rights violations, “free market” reforms had also been prescribed, this time under the supervision of Argentina’s New York creditors. In October 1970, General RenÃ© Schneider was assassinated in a plot of the ultra-right together with seditious elements of the Armed Forces led by General Roberto Viaux. The assassination of General Schneider was part of a coordinated plan to prevent Parliament from ratifying Allende’s victory in the September 1970 presidential elections. The June trial coup was “useful» indicating to the seditious elements within the Chilean Armed Forces that an isolated and uncoordinated effort would fail. After June 29, the right-wing elements in the Navy and the Air Force were involved in a process of consolidation aimed at gaining political support among officers and sub-officers. The Army, however, was still under the control of Commander in Chief General Carols Prats, who had previously integrated Allende’s cabinet and who was a firm supporter of constitutional government. Meanwhile in the political arena, the Christian Democrats were pressuring Allende to bring in members of the Military into the Cabinet as well as significantly revise the programme and platform of the Unidad Popular. Party leaders of the government coalition considered this alternative [proposed by the Christian democrats] as a ” legalized military coup» (golpe legal) and advised Allende to turn it down. Carlos Altamirano, leader of the Socialist Party had demanded that an endorsement of the programme of the Popular Unity coalition by the military be a sina qua non condition for their entry into the Cabinet. Upon the impossibility of bringing in the Military into the Cabinet on acceptable terms, Allende envisaged the formation of a so-called “Cabinet of Consolidation” composed of well known personalities. Fernando Castillo, rector of the Catholic University and a member of the Christian Democratic Party, Felipe Herrera, President of the Inter-|American Development Bank and other prominent personalities were approached but declined. “Hacia el Nuevo Modelo Economico Chileno, InflaciÃ³n y RedistribuciÃ³n del Ingreso, 1973-1974″, Cuadernos de CISEPA, no. 19, Catholic University of Peru, 1974, Trimestre Economico, no. 166, 1975, 311-347.